Who makes books? Authors and illustrators! If you didn’t have them you wouldn’t have a book. Read the text with your kids. 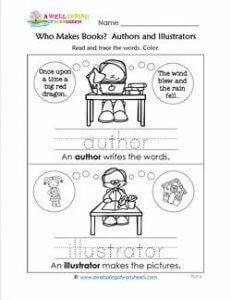 Have them color the pictures of an author imagining two story lines and busily typing out her text and an illustrator imagining some pictures and creatively putting those imaginations on paper.